Famous for its black opals, Lightning Ridge is also an excellent source of fossils including the earliest mammal find in Australia. 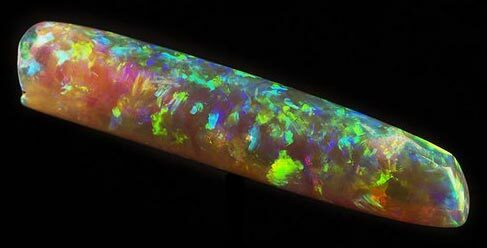 The fossils include dinosaur bone fragments and teeth, many of which are opalised and are consequently highly prized by collectors. Plans are afoot to build a new museum in the town to host the fossils including beautiful tiny pine cones, a theropod dinosaur’s tooth and ancient lungfish toothplates, all of which are replaced by opal (the museum is currently hosted in the office of the new museum’s prospective creator). The museum holds Australia’s largest opalised dinosaur skeleton, a portion of an ornithopod’s spine, skull, limbs and ribs. 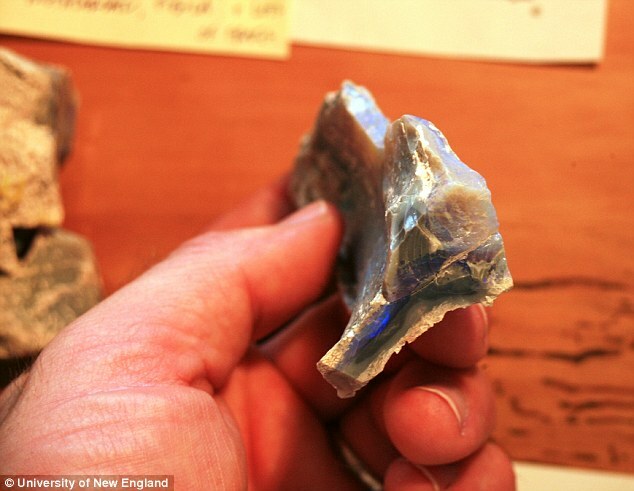 Dinosaur bone containing a flash of precious opal, held in the museum at Lightning Ridge. The new museum is expected to be completed by 2020.